Note: The full diploma has 3 modules running 3 days each. This programme was developed to help improve the knowledge base of reflexology practitioners who want to work clinically with clients who require support in managing their pain. The Nerve Reflexology Diploma encompasses three modules. Each module encompasses a combination of both theory and practical elements and can be taken either as stand-alone workshops or as part of the full diploma. Nerve Reflexology is an advanced reflexology training that uses a very precise pressure application and direction on the foot bones to affect the physiology of the nervous system. Each module runs from Saturday to Monday and will start at 10a.m. and finish at 5p.m. each day. You MUST complete all aspects of the 3 modules in order to gain the full title of 'Qualified Nerve Reflexologist'. What are the pre-requisites of this training? 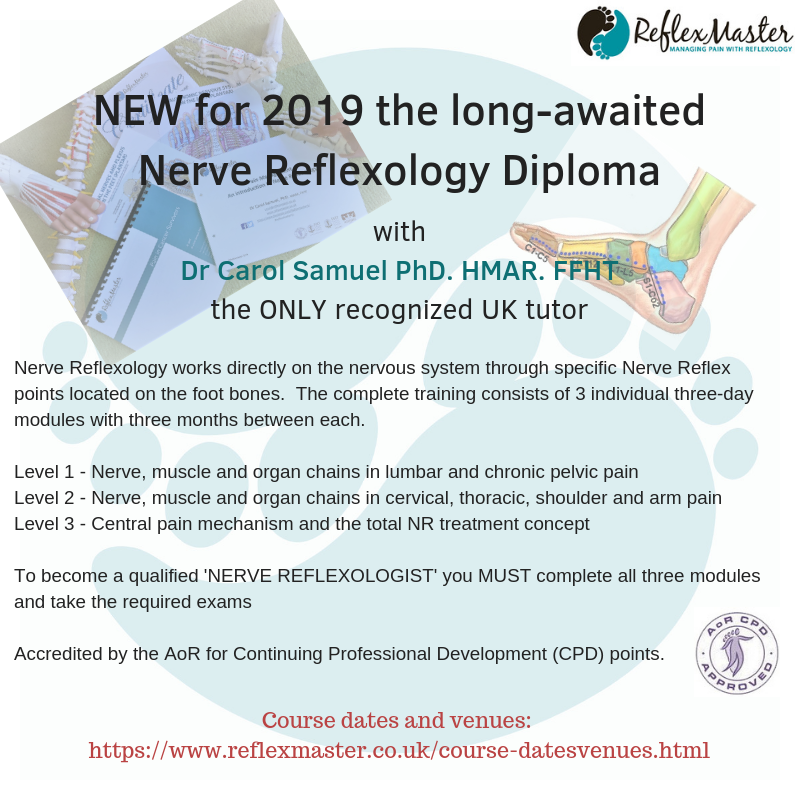 Whilst the theory of the nervous system and functionality of individual nerves is taught during your training, you should hold a professional qualification in Anatomy and Physiology either as a stand-alone certificate or as part of your reflexology training. This training is for Reflexologists trained at Level 3 or higher. However, nerve reflex points can be used in conjunction with other therapies, such as body work, acupuncture, osteopathy, chiropractic and physiotherapy, so ANY practitioner with an interest in combining these techniques into their current repertoire may also apply to undertake this training. Airmid Therapies is on your right at 27 Railside. Airmid Therapies is on your left at 27 Railside.